The result of Denman’s first international travel, in this case a trip to Trinidad in the West Indies, “Tapestry” represents a significant shift in style. 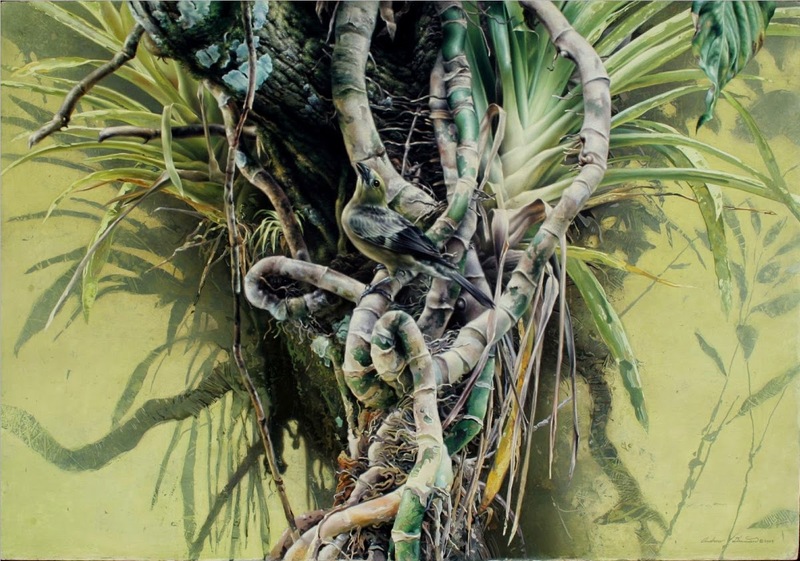 Here the stylistic and abstracted elements are melded seamlessly with hyper-realistic treatments in the artists’ portrayal of both habitat and wildlife. 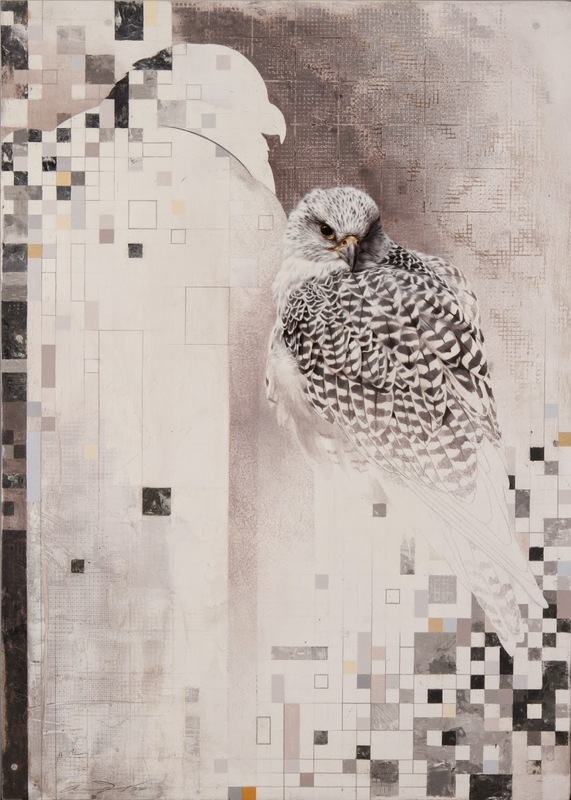 “In the increasingly crowded field of wildlife artists, Andrew Denman [b. 1978], stands out for his distinctive look in addition to his masterful painting skill” writes veteran art writer and magazine editor Jennifer King in an editorial for Create Better Paintings.com. Not only was “Indigo” Denman’s first painting accepted into a major museum exhibition, in this case, “Birds in Art” at the Leigh Yawkey Woodson Art Museum, but it was also the first time his use of abstraction, previously limited to background applications, spilled over into his treatment of the animal subjects. 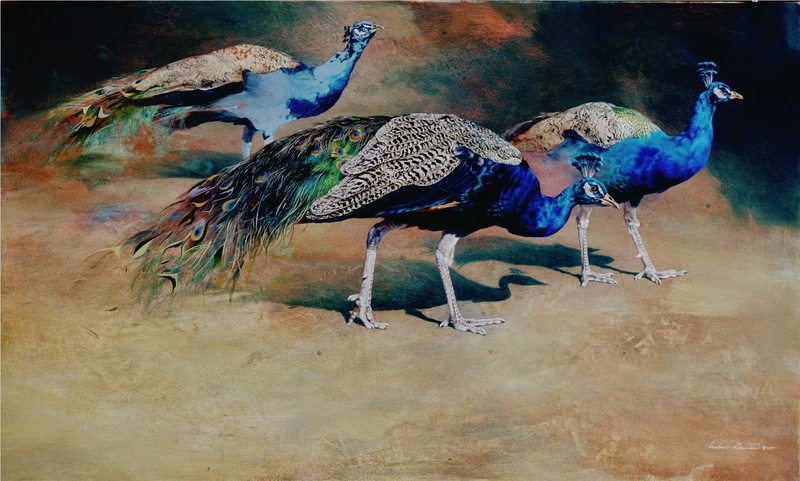 Denman is an artist known for capturing diverse subjects, from wildlife, to landscape, to still life, in an equally diverse range of styles. His recent work focuses on intimate wildlife portraits and scenes approached with a unique combination of hyper-realism, stylization, and abstraction. While Denman does not eschew the term “wildlife artist”, his work has moved well beyond the genre, often incorporating modern art elements as well as subject matter that most traditional wildlife artists avoid. Born in 1978, the Bay Area native showed a great degree of interest in art from an early age. Denman organized his first one man show in high school at a local library, and soon after began participating in exhibitions with Pacific Wildlife Galleries in Lafayette, CA. Since then, Denman has held four highly successful one-man shows at Pacific Wildlife. 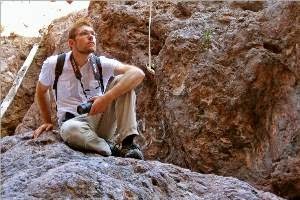 Locally, he has also participated in exhibits at the Bedford and Hearst Galleries, The Lindsay Wildlife Museum, the Oakland Museum of California, and the Bakersfield Museum of Fine Art. Typical of his mature style, Denman uses the flamingos, as they shift musically between styles and stages of completion, as a vehicle for exploring the paint itself and the process of painting. “This little fellow captured my heart one day on a trip to the San Francisco Zoo. Anyone who has ever named a pet is guilty of anthropomorphization and in some wildlife paintings, such sentiment creeps subconsciously into the artist’s portrayal of the anatomy. My goal is to not let my feelings of identification with an animal subject distort the accuracy of my representation, but I’m not at all above allowing emotion to shine through in the pose or expression I select or the title of the piece. And the violet mystery, too. And the pure, peerless white of the page. Unfurling like stars in the night. And the root and the stem and the seed.